Projects follow the “Basics” taking the new medium, technique or concept and applying it to a finished work of art assessing the new skill acquired through Basics. Projects ALSO build on previous skills. Choosing to not participate or practice a skill will have a snowball effect. Later Projects AND Classes will continue to add new skill, mediums, and concepts but will continue to build on ALL previous skill learned. The beginning and ending stages of growth look different from student to student. Growth can only be accomplished by practice. Practice happens when each assignment is done in the spirit of which it was assigned and not as busy work to appease your parent, teacher or anyone else. The habits, practices and expectations that demonstrate effort are taught in class. Do the Line and Shape BASICS before starting this project. Work in #2 Pencil - always use a ruler and stencils. DO NOT COLOR IN WITH PENCIL - outline only. Measure a 1 inch boarder around your paper. Divide the space inside the boarder into at least 15 sections. The remaining sections can be filled with more of the above and or repetitions of the above. Final step is to retrace all patterns with Sharpie - use the same rulers and stencils used with the pencil. Fill in spaces with the Sharpie. 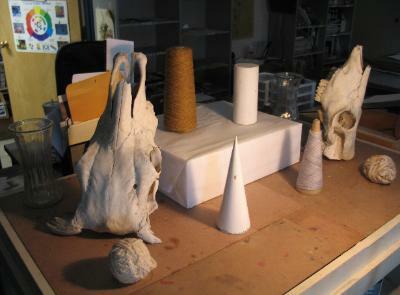 ​This project is assessed on the student's ability to follow directions and craftsmanship. Score received is out of 25 points. Extra Points can be earned as an incentive for students who go ABOVE AND BEYOND the expectations set for personal goal setting, growth and effort. Do the Graphite Basics before starting this project. This project is best taught through demonstration and full instructions will not be posted. Everything will be measured with an ruler and plotted on paper using three lines to measure from. The bottom of the shoe, the front of the shoe and the back of the shoe. 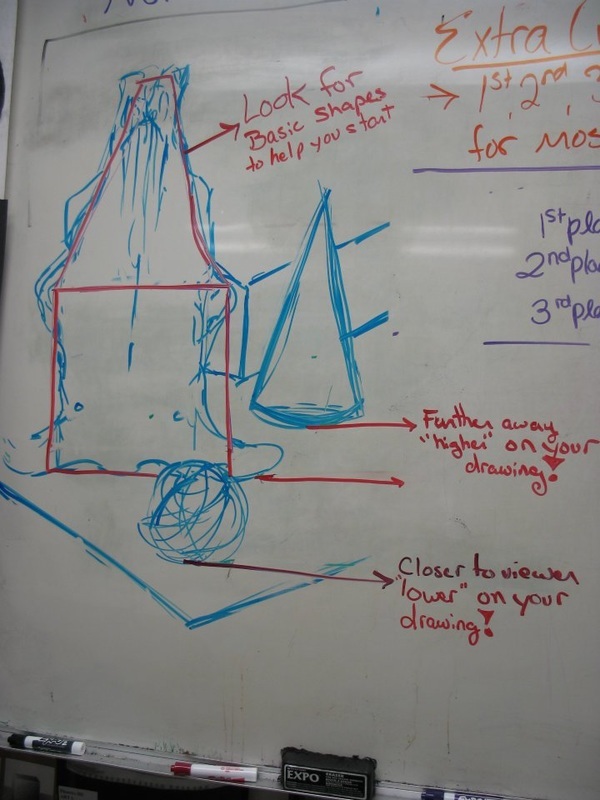 This assignment is to help students start to understand the flattening of space. Taking a 3D object and accurately, to scale, recreating it on a 2D surface. ​This project is assessed half on the student's ability to follow directions and craftsmanship and half on ability to use full range of value, smooth transitions, and the ability to create edges that don't rely on outlines. Score received is out of 25 points. ​Extra Points can be earned as an incentive for students who go ABOVE AND BEYOND the expectations set for personal goal setting, growth and effort. Do the Charcoal Basics before starting this project. Students will begin to start having more control or choices about the direction of their work. Students will have a choice between Smooth or Hatching technique and between White or Black Charcoal. Students are asked to choose, based on individual skill level, to challenge their ability. 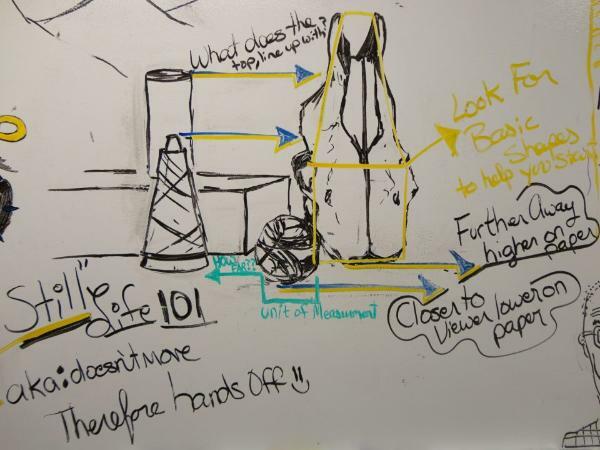 Still Life drawing is a great opportunity for students to start to understand the relationship between objects in 3-D space and how to translate to a 2-D surface. Students will learn techniques to record accurate proportions on paper. Skills introduced include Gesture Drawing and Comparing aspects of the object... ie the width of the widest part is 3.5x the width of the eye socket. This project is assessed the students ability to work from observation, use full range of value, smooth transitions, and the ability to create edges that don't rely on outlines. Score received is out of 25 points. Produce a large contour line drawing. What would shattered glass look like? Spiral lines of a nautilus shell? Geometric division of shapes... squares, triangles...? These lines will overlap your previous line drawing and will alter how it looks. The idea is to create many more shapes, like a giant puzzle. Apply the entire range of value to each individual newly created shape. Proceed from shape to shape and for each shape decide which part will be the dark and which part will be the light values. Each individual shape will include the entire value scale. Think about dividing the space into thirds...One 1/3 = light (including white), 1/3 = medium, and 1/3 = dark values. Fill the entire paper with values including both the positive shapes and the negative background shapes. Edges should not be created by lines but by different values touching. Careful to not lose your edges by placing the same values next to each other, causing the edge dividing the spaces to be lost. ​This project is assessed on craftsmanship and on the ability to use full range of value, smooth transitions, and the ability to create edges that don't rely on outlines. Score received is out of 25 points. Students will work from a picture. Student will fold the picture in half two times both directions, creating grid lines down center and on the quarter lines. On a larger proportionate paper students will measure to find center and quarter lines. Students will transfer information box to box from their small picture to the large paper. 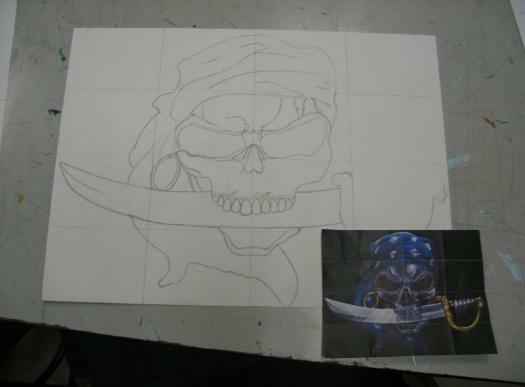 After the image is drawn, the grid lines are erased and shading is done. All edges are changes in values and not outlines. This project is assessed the students ability to work from reference material, correct use of grid lines, use full range of value, smooth transitions, and the ability to create edges that don't rely on outlines. Score received is out of 25 points. Do the Stipple Basics before starting this project. Students will work from a photograph. 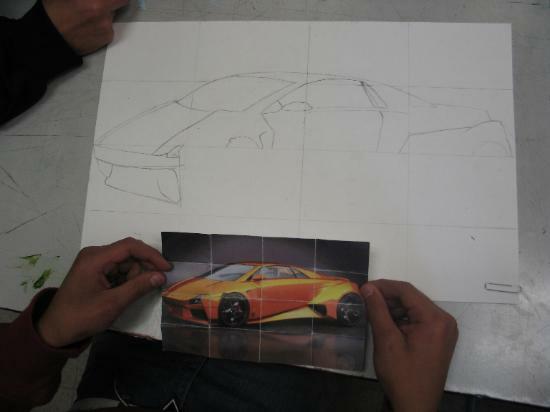 Students will use the grid-to-grid method to start this drawing. A light sketch in pencil will be done before students begin to stipple. The shading will be done using only small dots.